“Los Lobos,” courtesy of Jean Thomas. The Santa Cruz County Bank is currently hosting an exhibit called “Painting Our Parks” in its many locations across the county. 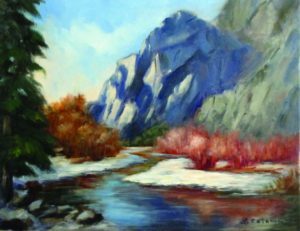 The exhibit, which has run from Sept. 17 through Jan. 18, is a collaboration with the local group Santa Cruz Oil Painters (SCOP) and features over 100 oil paintings of local, state and national parks located across California. Since the Santa Cruz County Bank opened in 2004, it has been committed to collaborating with various local artists in an effort to promote art education and awareness. For “Painting Our Parks,” Carson wanted to capture the natural beauty of California’s parks while also promoting the oil paintings of SCOP. Created in 2001, SCOP is a small community of about 30 artists committed to fostering a communal appreciation for the oil painting art form. Through weekly participation in “plein air painting” outings — the act of painting outdoors and on location from the French word “plein” meaning open — the group’s identity is intimately linked with an appreciation of nature. Co-founder of SCOP, Michele Hausman, discussed the rewards of painting in front of natural landscapes. “Yosemite,” courtesy of Lorraine Catania. In addition to these excursions, SCOP organizes monthly critiques of their artwork, maintains a collection of art instruction DVDs and usually has an annual full-group workshop. The oil paintings themselves are impressionistic, vibrant and pleasantly fuzzy, conjuring a warm atmosphere that pays tribute to the vast and sprawling landscapes. One member of SCOP, Lorraine Catania, finds oil painting to be an incomparably effective art medium. For Catania, plein air paintings are meant to “capture the feeling of the subject matter without a lot of detail,” and are usually studies for more expansive pieces to be finished in a studio. With the budget for state parks consistently waning, Hausman and her collective of nature-oriented painters are eager to raise public awareness for the diminishing funds. 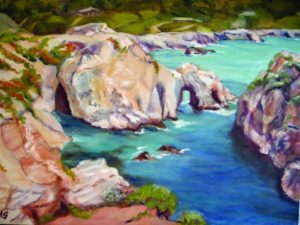 While 100 percent of proceeds for Santa Cruz County Bank exhibits typically go to the artists, SCOP chose to donate 20 percent of exhibit funds to the Friends of Santa Cruz State Parks group, which is a close-knit community of nature enthusiasts who work to preserve parks throughout the state. One way “Painting Our Parks” has combated the statewide park problems has been to encourage visitation of the more obscure local parks under most people’s radar. For more information on the Santa Cruz Oil Painters, visit santacruzpainters.blog.com or visit any of the Santa Cruz County Bank locations to see the exhibited paintings.